A landmarks preservation board granted the designation to the 55-year-old facility Wednesday. Members of OVG and the city are expected to meet shortly with the landmarks board to begin discussions on how to keep their renovation plan within the parameters of the designation. 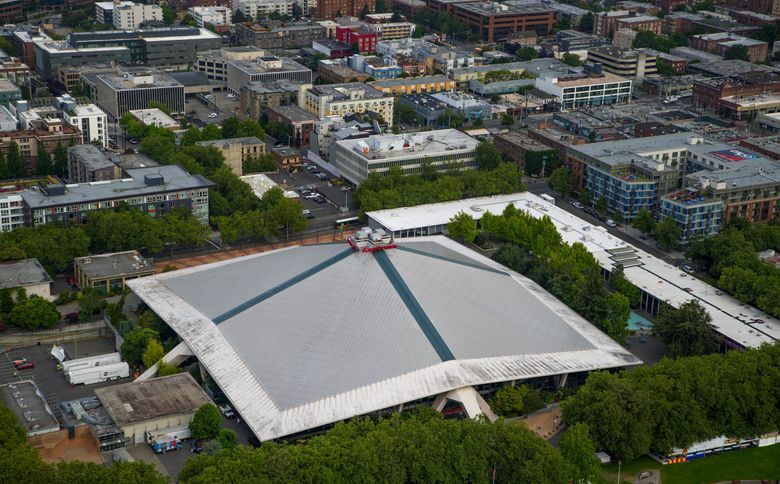 KeyArena and its iconic roof have officially been designated for local historical landmark status, meaning any renovation of it must take specific steps to leave certain elements intact. A city-appointed landmarks preservation board granted the designation to the 55-year-old facility at a public meeting Wednesday night at city hall. The board, consisting of architects, historians, a structural engineer and representatives from the fields of urban planning, real estate and finance, granted the designation for both the arena’s Paul Thiry-designed roof and its exterior walls and support trusses. “They can make alterations but they have to go through a process,” Erin Doherty, landmarks board coordinator for the KeyArena project, said in an interview after the decision. The board also approved designating the nearby Bressi garage, home to Pottery Northwest. But the board rejected designating both the NASA Building and Blue Spruce Apartments — part of the same 1962 World’s Fair as KeyArena — saying they had limited historical significance and had either lost much of their architectural integrity, or were not unique enough as buildings. The Los Angeles-based Oak View Group (OVG), led by Tim Leiweke and Irving Azoff, has proposed a $564-million private-funded renovation of KeyArena for NBA and NHL use. OVG is in negotiations with the city on a Memorandum of Understanding (MOU) that is to be presented to city council by Sept. 12. Doherty said members of OVG and the city are expected to meet shortly with the landmarks board to begin preliminary discussions on how to keep their renovation within the parameters of the designation. There are six criteria to be considered for local landmark designation status and buildings can qualify by meeting as little as one of them. In a prior June meeting in which the landmarks board unanimously nominated KeyArena for the designation, several board members noted that it appears to qualify under all six criteria — the biggest being its association with a major historical event and impact on the community. At Wednesday’s meeting, board members agreed their opinions hadn’t changed and that the designation was a “clean sweep” on all six fronts. The city council will review and decide whether to approve the MOU for Key­Arena in a vote, but first must make a call on whether a second, all-private proposal to build a brand new arena in the city’s SoDo District should proceed. The SoDo group, led by entrepreneur Chris Hansen, had a prior MOU with the city calling for use of up to $200 million in public bond funds if he can land an NBA franchise prior to the deal’s Dec. 3 expiration. The NBA has repeatedly said it is not close to launching an expansion process and no teams appear prepared to relocate elsewhere. Hansen himself has now said the NHL is more likely to arrive in Seattle first, which is why he has pitched the separate, all-private proposal. But his former MOU still has to expire first before the city can finalize any contract on KeyArena. The landmark designation for KeyArena could also help OVG in its quest for up to $70 million in federal tax credits should the building be declared a federal historical landmark. OVG has applied for that designation in a completely separate process — one not necessarily obliged to consider Wednesday’s decision — that could take years to play out.